Myoporum sandwicense is a highly variable species. Generally it is a shrub or small tree that can grow up to 40 feet, in the drier habitats of the islands. This variety grows very low to the ground, hence its name: Naio papa or "flat Naio." Description: Naio papa is a crawling ground cover with dark, glossy green leaves and tiny white or pink flower clusters that emerge from the leaf axis and stems. It has roundish white fruit growing up to 1/4-inch in diameter. There are two prevailing forms of this plant: One has purplish stem tips with leaves having a purple midrib. The leaves are also more narrow and the white flowers have pink centers. 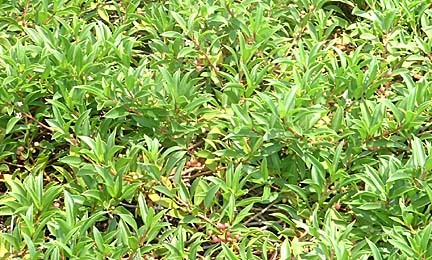 This form "bushes out" more and will often compete with itself for the sun, resulting in ground cover up to a foot tall. The other form is completely green with leaves that are much thicker, almost succulent in appearance. The flowers are all-white, and rather than "bushing out," this form hugs the ground and is more matlike, growing 4 to 6 inches tall. Both look great and can be mixed together. Distribution: Naio papa is known to grow only on the South Point coast of the Big Island. Landscape Use: This is a drought-, salt- and sun-tolerant plant that makes a beautiful, low-maintenance ground cover. Naio papa also looks good crawling over rocks, which makes it a great candidate for rocky gardens. Full sun with well-drained, perhaps sandy soil, is best. Daily watering is OK to get the plant established; reduce watering after two to four weeks to slow its growth to create a more natural look. Many plants that thrive in coastal or dry environments prefer a good soaking with long intervals of no watering to let the soil dry out. This prevents over-watering and the chance of root rot, which is lethal to the plant. Few pests bother this plant, but if you do notice infestations, the Naio papa can handle proper applications of pesticides. Rick Barboza co-owns Hui Ku Maoli Ola, a Native Hawaiian plant nursery, with Matt Schirman. Contact him at 259-6580 or e-mail rickbarboza@hawaii.rr.com. "In the Garden" is a Friday feature. In the Garden runs Fridays in Today.